The arrival of Windows 8 has given laptop manufacturers something of a conundrum – given that the OS is all about its touchscreen credentials, how can this be utilised within the portable computing form factor. Toshiba has decided that giving its P845 range a capacitive touchscreen could be the answer, and showed off the new machine at IFA 2012. 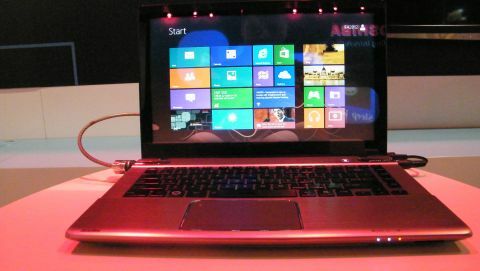 Although its looks are never going to wow crowds, the Toshiba Satellite P845t is a very capable machine. It offers the power of third generation Intel core processors, Nvidia Geforce processing and Harmon Kardon speakers, so it is definitely not scrimping on high-end features. The laptop has been built with media professionals in mind, the 14-inch screen a decent size for those editing photographs and large enough to entice gamers in as well. And then there's the newly introduced touch functionality. Given that most people have come into contact with touchscreens through portable devices, it's more than a little strange to touch your laptop screen in a vertical position. It just feels, well, a little odd. And, if you are like us, forever wiping dust off the screen you are not going to be too impressed with the fingerprint trail you are bound to leave on the laptop. This isn't to say the screen on the Toshiba Satellite P845t doesn't work well. It does – pinching a zooming functionality is great and Windows 8 certainly comes into its own when you use it as a touchscreen OS. But it is a little confusing for the end user – as there's a perfectly reasonable track pad on board, we seem to veer towards using this far more than poking and prodding the screen. The continued reaching over the keyboard seemed to be something of an issue as well. We were constantly having to stop our watch and hand grazing the keys. The Toshiba Satellite P845t is a powerful piece of kit, however. On board is 6GB RAM, 640 GB HDD, 3x USB 3.0 and an optional Blu-ray player. While the addition of a touchscreen will certainly be of interest to many, the rise of hybrid machines this year may well mean that it gets overlooked.